A colorful bouquet is not only beautiful but also meaningful when you learn the language of flowers. Whether you’re celebrating Valentine’s Day or Galentine’s Day, early February is a very popular time to send beautiful bouquets to loved ones. Many floral gifts that we send (and receive!) on Valentine’s Day, like traditional carnations and roses, carry connotations with ancient origins. From the garlands and wreaths of ancient Rome to our own fabulous rose bouquets of today, flowers imbue meaning and make a wonderful gift. The term “love blossoms” shows just how important flowers can be when expressing affection for those we care for. An interest in the language of flowers, or floriography, came about in the mid to late 1800’s when many Victorians would consult floral dictionaries to create a perfect and meaningful arrangement to send to a loved one. For the Victorians, sending subtle messages through flowers was their way of expressing how they felt, like secret Valentines cards we all know of today. Studying floriography resulted in creating nosegays or tussie-mussies, small bouquets of tightly arranged flowers. These arrangements were picked and tailored intentionally to pass along messages to the receiver and worn as a fashion accessory to show others the message of adoration. Roses of any color are a Valentine’s Day classic. 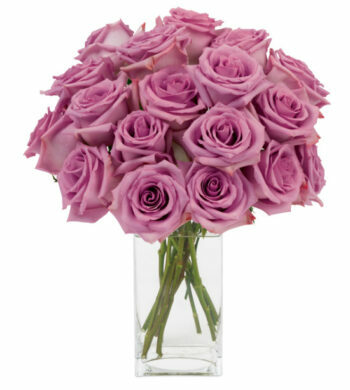 These Radiant Roses give you an array for a romantic gesture. Every rose also has a special meaning to bestow. 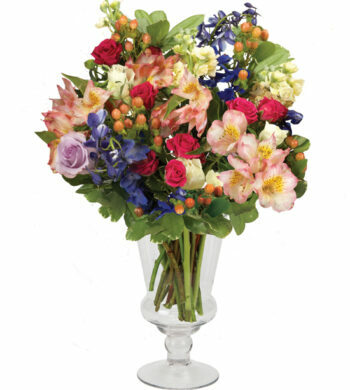 The most recognizable romantic gift, these gorgeous flowers signify love and desire. Roses have been a symbol of love since ancient times when Romans would send them as a message that there was a confidential matter they wanted to discuss. Now, roses are a symbol of love and passion. 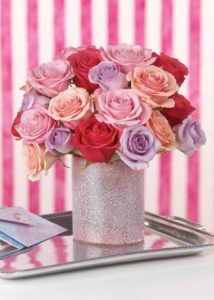 Rose color meanings can also be a part of a very special message you send with a bouquet of luxury roses. Sending red roses to indicates a deep, romantic love while a burgundy bouquet of roses shows adoration. For something lighter, yellow roses express friendship and pink roses mean gentle love and happiness, making them a wonderful Valentine’s gift idea for a beloved family member or friend. 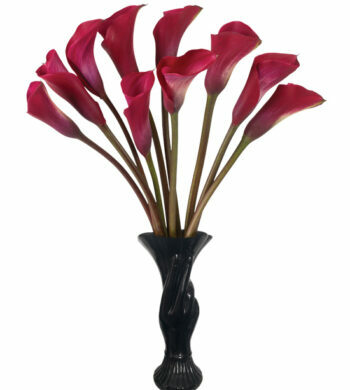 A bouquet of Raspberry Calla Lilies and a bottle of bubbly would make a fabulous, romantic Valentine’s gift. Lilies symbolize purity, loyalty, and virtue and have been used in religious symbolism for centuries, making them the perfect flower to express devotion to a faraway friend or loved one. Lilies often come in white or warmer hues such as orange Asiatic lilies or pink Amarossi Oriental lilies. Amarossi lilies, like the ones in our Loving You Lilies bouquet are quite fragrant and perfectly pink to create an arrangement that is delightfully romantic. More specifically, the Calla lily is a variety that is often recognized as a popular wedding flower, sharing a message of love and adoration. 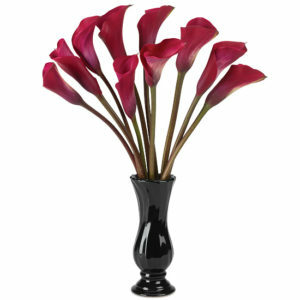 Calla lilies are especially meaningful because of their beautiful trumpet-shaped blooms that look like champagne flutes. Pair our Raspberry Calla Lilies with a bottle of your favorite bubbly to create a romantic gift that anybody would want to toast to! For something a little more exotic, the orchid represents love, luxury, and beauty. Orchids have been highly regarded with their delicate beauty and distinct blooms. Hailing from tropical origins, orchids were historically difficult to procure, making them even more desirable. And while chocolate has come to be the universal Valentine sweet, the vanilla bean actually comes from vanilla orchids! Aztecs revered the vanilla bean as a symbol of strength and power, and is often considered a luxurious scent and flavoring. Do as the Aztecs did and add a little vanilla to your hot chocolate or sweets this Valentine’s Day to take full advantage of the beautiful symbolism of this flower. But if, like us, flowers are more your speed for a thoughtful message, orchids are a wonderful option as the choices are vast: select loose bouquets for a more traditional romantic gift or a potted plant for somebody with a green thumb. We have both varieties of orchids for you to browse and find exactly what you’re looking for from mixed bouquets to specific colors. 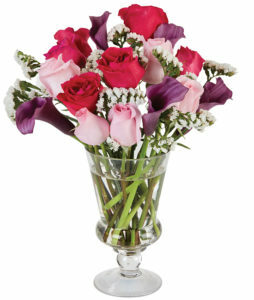 White or purple accents are lovely for a little twist on the classic pinks and reds of Valentine’s Day. Valentine’s Day, and romance in general, has always been associated with deep reds and rosy pinks. 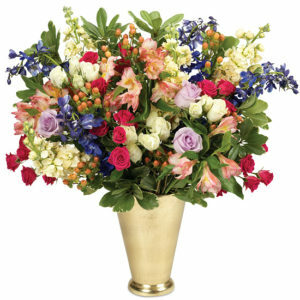 However, there are many other colors and varieties of bouquets bestow a beautiful message in a bouquet or arrangement. Often, flower color meanings are just as important as the actual blossom you choose as color can set a mood or express how you feel. Sending a colorful bouquet in less traditional colors is a great way to put a twist on a classic and send an even more impressive message! Lavender, a lighter shade of purple, still has many of the same qualities of its deeper-hued cousin. Meant to symbolize royalty and dignity, lavender flowers capture a cool elegance and bring about a feminine feel without being over. Our lavender roses are the perfect example of this, arriving in a silver, mercury glass vase that creates an absolutely enchanting look. White is best known to symbolize purity but can also signify thoughtfulness and fidelity. A bouquet of white flowers would be a lovely gift for a beloved family member or children to show that you are thinking of them. Combining white blossoms with other colors in arrangements also lift the mood for a lighter, brighter look that is more affectionate than deep or dramatic. Blue may seem like the opposite of what we think of in terms of Valentines colors but shades of blue can be a beautiful departure from the traditional Valentine shades. Blue is meant to express peace and hope while also being a symbol of trust and peace, making this color good to convey commitment. In a bouquet, blue flowers can be beautifully elegant and a bit whimsical. Bouquets of flowers are always a special and thoughtful gift, and using the language of flowers can make a bouquet or floral gift even more significant. Follow this guide, and your heart, while browsing our selection of Valentines flower bouquets and arrangements to find the perfect one is right for your loved one and what you want to express this holiday! We hope our luxury floral gifts will make it a great one.